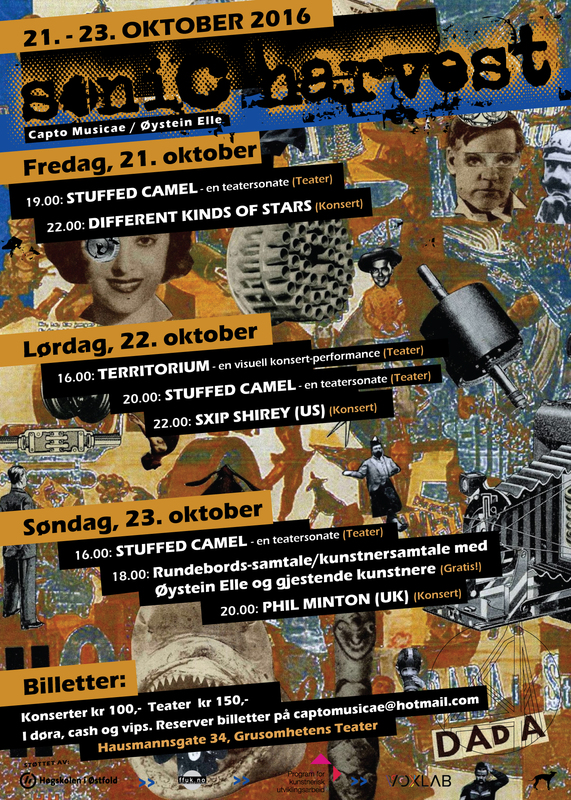 SONIC HARVEST is a three days event marking the end of Øystein Elles three years long Research fellow position as a creating and performing artist at the Academy for scenic art in Fredrikstad, Norway. His Project “Capto Musicae – Creating Sonic and Musical Theatre in a Contemporary Artistic Context”, was chosen to be included in a research program “Nasjonalt Program for Kunstnerisk Utviklingsarbeid”. This is a unique program which finances a small group of research fellows which works for the art it self as a subject for research. The thesis is the art, with associated reflection reagarding amongst others, methodology and context. At the disputation the art it self is what the candidate is defending, as opposed to the theoretical research about the art. Now Øystein Elle delivers his closing artistic result at Grusomhetens Teater in Oslo. In the door, cash or “vipps”.